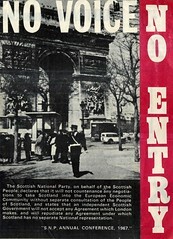 Democracy for Scotland Exhibition, originally uploaded by Scottish Political Archive. 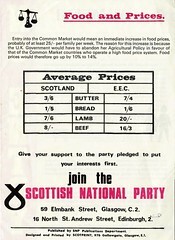 The exhibition draws largely on the collections of the Scottish Political Archive (SPA). SPA is based at the University of Stirling and is dedicated to collecting oral and other material relating to the political history of Scotland in the twentieth and twenty-first centuries. 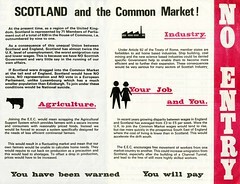 The exhibition features referendum campaign materials including leaflets, pamphlets, posters and badges deriving from all the major political parties and umbrella groups. 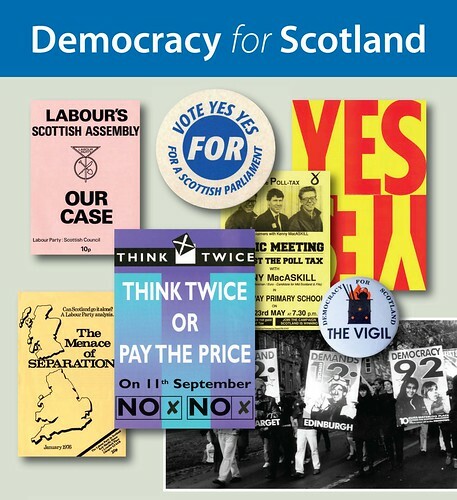 It also offers visitors the opportunity to hear the voices of politicians and campaigners discussing their experiences of the referendums of ’79 and ‘97, the intervening period and the establishment of a Scottish Parliament.